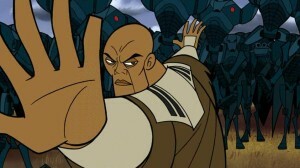 Airing in the spring of 2004, season two of Star Wars Clone Wars picks up immediately where season one left off, with Anakin Skywalker giving chase in his fighter craft, going after Asajj Ventress. While Anakin clearly has had immense success against droid pilots, he realizes that this pilot is not a droid and is quite talented, as we see a fascinating aerial battle taking place between the two of them. 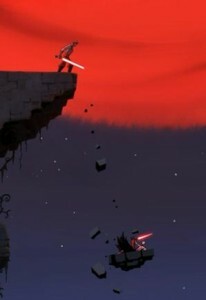 Ventress then swoops down on the planet, with Skywalker following after her, which leads to Obi-Wan Kenobi being quite upset about Skywalker’s whereabouts: “You’re supposed to be in space, leading our forces!” Anakin tells him that the Force is strong with this one, to which Obi-Wan agrees, but still demands that Skywalker not give further chase (“I have a bad feeling about this.”). Anakin disregards his direct orders and, instead, gives further chase, until Ventress jumps into hyperspace, and Skywalker following. 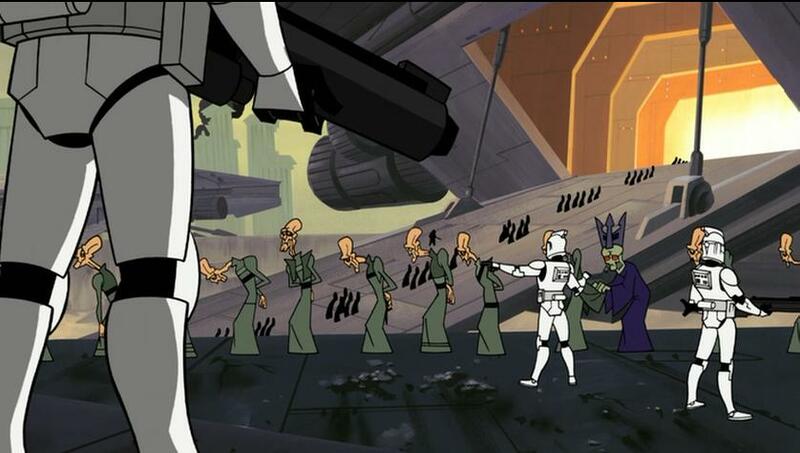 Obi-Wan, not happy with his padawan, sends a squad of clone troopers after him. 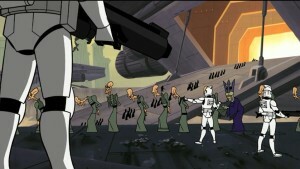 Anakin lands on a planet within a lush jungle, followed by the squadron of clone troopers. 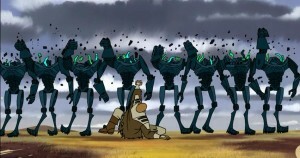 Anakin orders them to search out the other pilot. While searching the jungle, the entire squadron is killed off, as well as their ship and Anakin’s being destroyed, all without seeing who is doing it. Finally, we see Asajj Ventress – wow, she has some incredible Force power if she can do all of that! She probably has more Force power than Anakin does…. She finally shows herself and tells Anakin, “Come, padawan, your fall will be my ascension to the Sith.” They then engage in a lengthy and involved light saber fight. Although it’s mostly even, it seems that she might have the advantage and upper hand. Eventually, they get to some sort of temple-like structure and fight (whilst it begins raining). Eventually, while they are fighting on top of this temple in the ominously red light of a moon, we see his light saber knocked out of his hand. 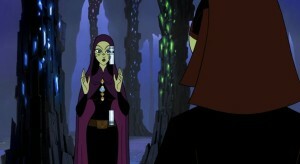 However, Skywalker is able to grab her wrists and even get a lightsaber. 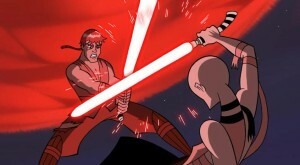 Then, with “Duel of the Fates” playing, he then attacks her harshly with the light saber! 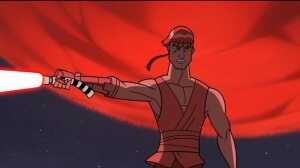 With the redness and the music, we then see him attack her until she falls off the ledge into a seemingly endless pit. While we don’t know if she dies or not, that seems to be the end of Asajj Ventress. Clearly, this latter sequence is meant to foreshadow his descent into the Dark Side. 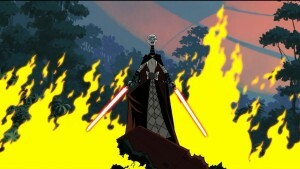 Ironically, while Ventress states that “your fall will be my ascension to the Sith”, it turns out that her literal (and metaphorical) fall was another step on his descension/ascension to the Sith. If this was somehow unclear to the casual watcher, it was made obvious by the mood, lighting, music, and visuals of the scene. It’s entirely unmistakable that this was meant to be a turning point for Anakin Skywalker. It seems that Darth Sidious’ plan to send Ventress after him was successful (while Count Dooku probably hoped for her to vanquish Skywalker, Sidious’ plan was intact). The most exciting battle and, perhaps, Jedi of Season two is that of Mace Windu fighting on Dantooine. 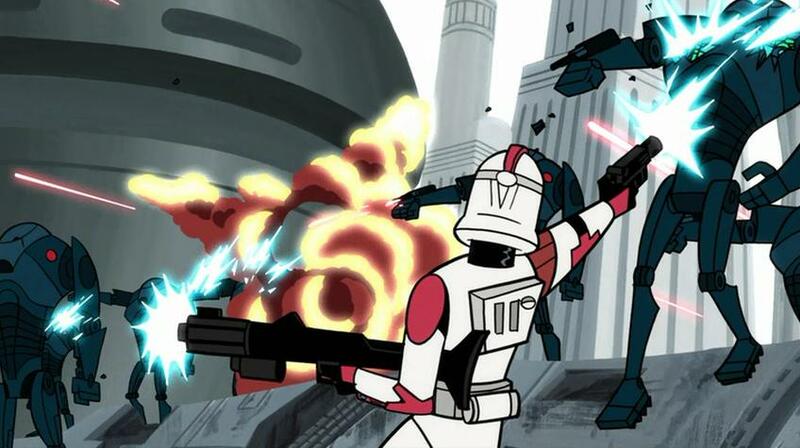 We see a big battlefield of clone troopers fighting battle droids and many super battle droids when a massive ship slowly hovers over to the middle of the battlefield and pounds down onto the ground with immense force, destroying droids and clone troopers, alike, for a wide radius. Mace Windu realizes he needs to stop it since no amount of blaster shots can stop it. 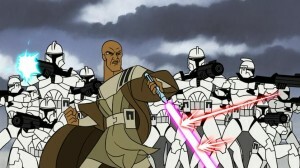 Mace Windu then shows off his incredible fighting capabilities. Wow! No one fights like Mace Windu – he is destroying super battle droids like nothing – left and right, with a light saber and without. 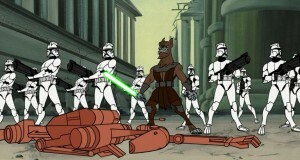 Mace Windu works his way up to the massive ship and destroys it, followed by returning to the battle field. But, wow, he is an impressive fighter! 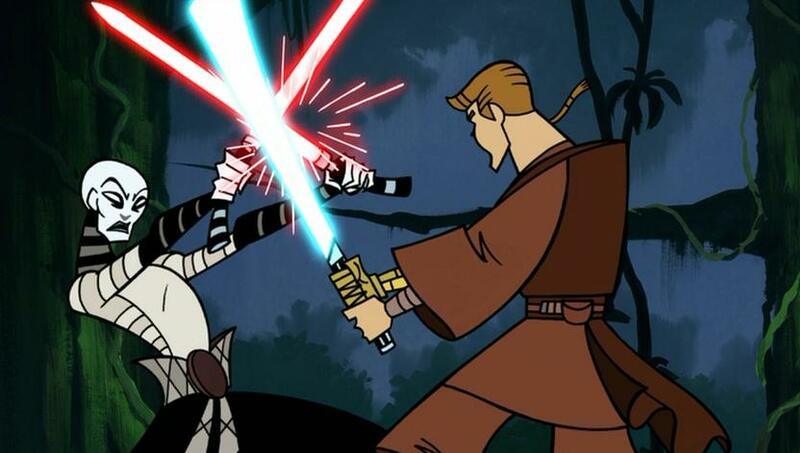 If one sees only one fight scene from the entirety of Star Wars Clone Wars, this should be it – it is very exciting and exhilarating to watch! The crystal is the heart of the blade. The heart is the crystal of the Jedi. 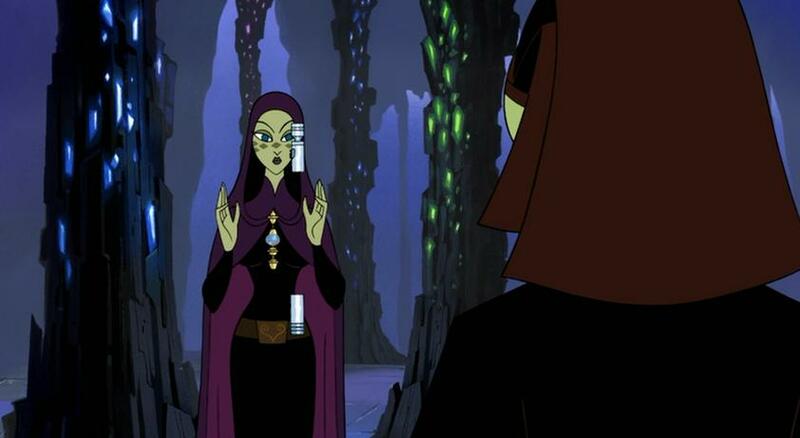 The Jedi is the crystal of the Force. The Force is the blade of the heart. 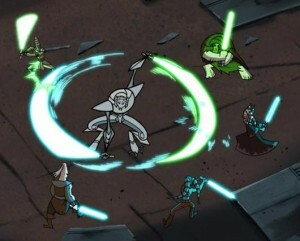 All are intertwined: the crystal, the blade, the Jedi. You are one. 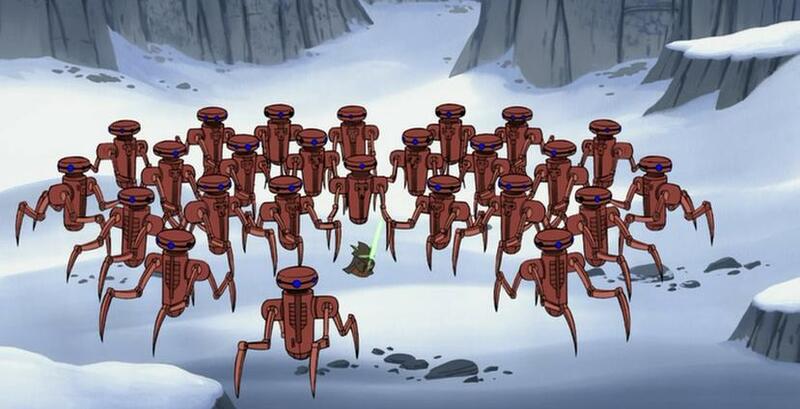 However, we then see a mass infiltration of chameleon droids in the temple, which is followed by Barriss Offee and Luminara Unduli fighting valiantly against these droids. 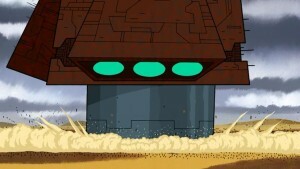 Despite their best efforts at fending off the invasive droids, the bombs, which were on timers, finally go off, sending many rocks down, which should kill them, yet, they are able to use the Force and create a space for them to survive beneath the rocks. Next, we see Yoda, who’s travelling with Padmé, who senses this disturbance and says, “To Ilum, we must go.” Yoda arrives and immediately meets many, many similar droids, destroying them, then finally making his way to the cave. We also see Padmé trying to get involved, when she shouldn’t. After Yoda rescues the two Jedi, he says, “Pained my heart is. Nearly destroyed, the temple was. Revealed its secret location is. But, by whom, I know not.” Whereupon, R2-D2 accesses one of the droids memory banks and discovers that it is Count Dooku who had sent them. 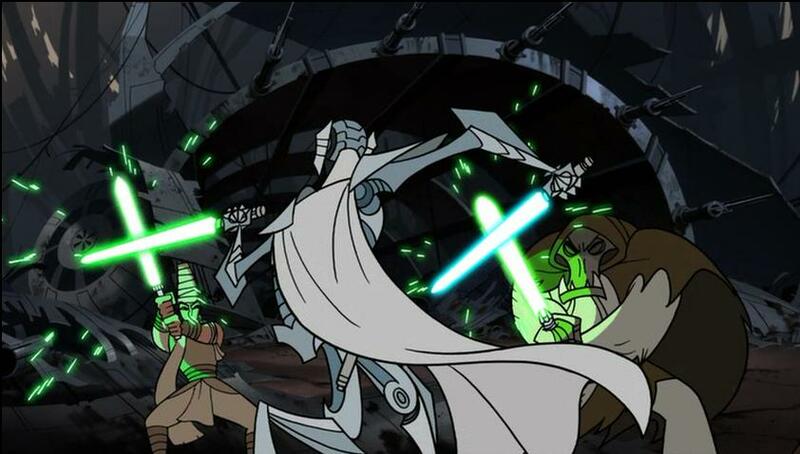 This “battle” is fascinating for a number of reasons: 1) we see that the end of a Jedi’s training is constructing his/her own light saber, 2) we see that there is a particular temple on a planet that houses the crystals necessary for constructing one’s light saber, and 3) we see that Count Dooku is out to utterly destroy the Jedi, including their being formed and their creating new light sabers. 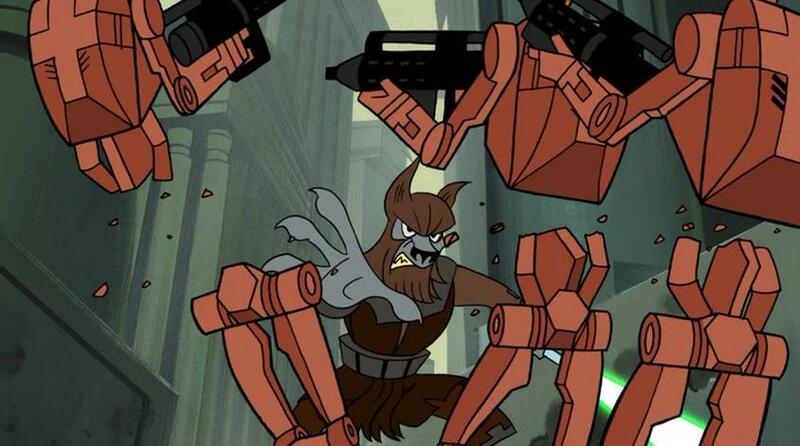 We then return to Muunilinst, where we see Jedi Master Voolvif Monn fighting alongside clone troopers against battle droids, decimating them. Eventually, we hear Obi-Wan Kenobi radioing to him that the IG Banking Clan has surrendered and that they have won the battle of Muunilinst. Shortly, thereafter, Anakin returns to Obi-Wan on Muunilinst in Ventress’ ship and, although he apologizes, he does say he emerged victorious. We’re then brought to Planet Harpori, where we see vast numbers of super battle droids encircling a downed Republic ship, although ceasing their fire, with a half-dozen Jedi encamped within (although we discover that one of them is merely a padawan), worrying about what to do. After easily killing off the padawan, General Grievous battles up to five jedi simultaneously – he is fierce! 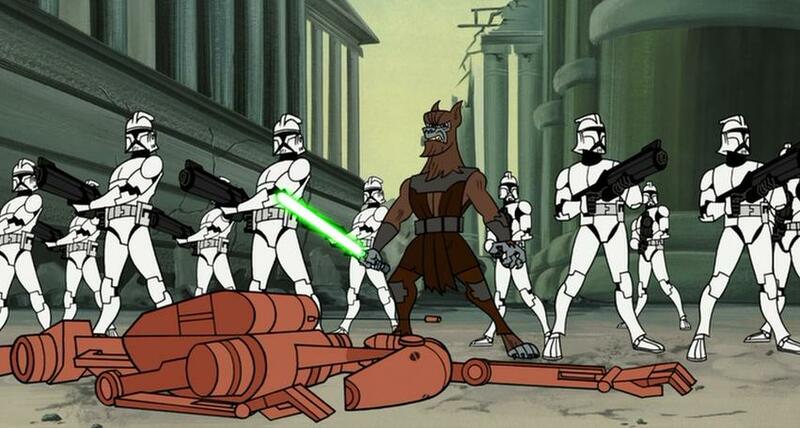 Eventually, he kills off all of them, except for Shaak-Ti and Ki-Adi-Mundi, whom we see battling him. 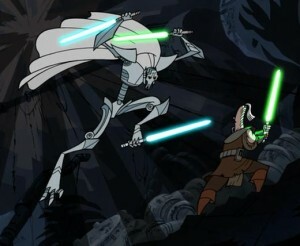 General Grievous looks very formidable! At the end, we see Grievous on the attack against Ki-Adi-Mundi….. In this season, the first nine episodes last roughly three minutes each, with the last one lasting over seven minutes, for a total of a little over 36 minutes of total runtime. Also, there is a minimum of dialogue throughout. 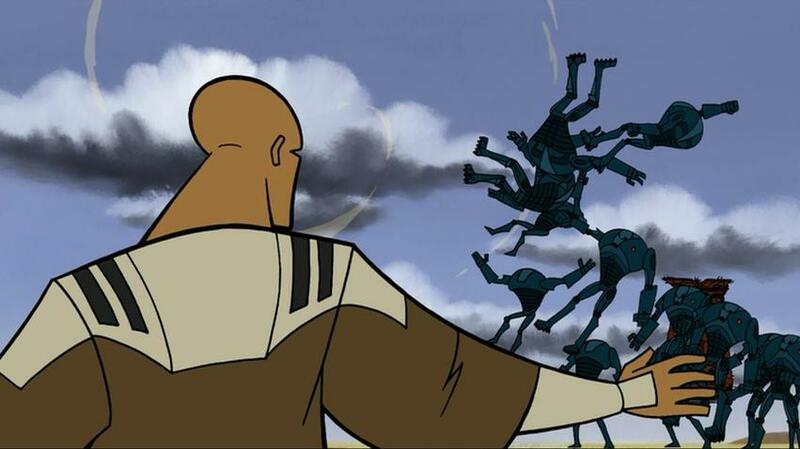 For instance, the only dialogue we hear in the battle scenes on Dantooine are those of the battle droids – none from Master Windu. 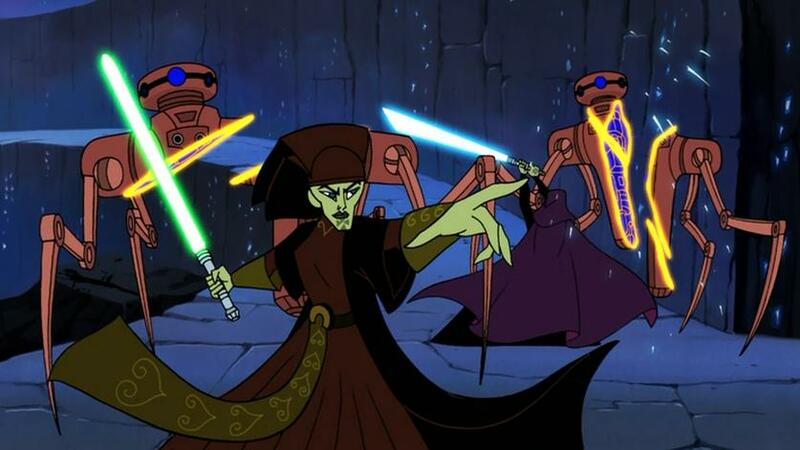 In the fighting scenes between Skywalker and Ventress, there is very little. The most dialogic interchanges are those between Skywalker and Kenobi and between Yoda/Padme/C3PO. 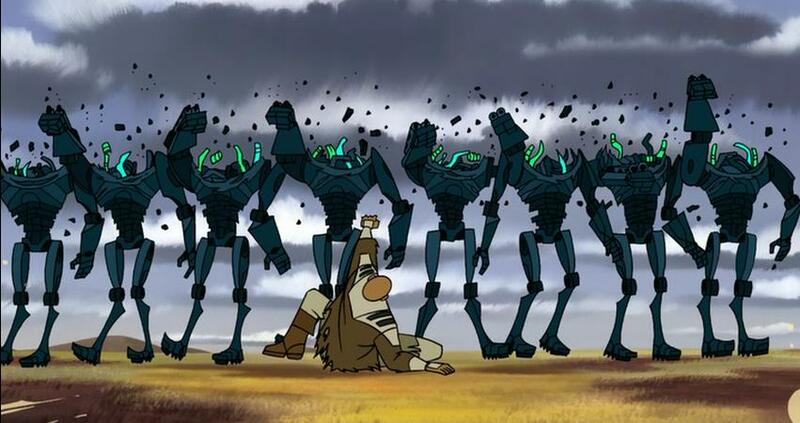 At the end, we are then taken to Harpori, where the Jedi then talk amongst themselves about what to do and how bad the situation is with this new foe.